Wario Land: Shake It (aka Wario Land: The Shake Dimension in Europe) is the 5th installment Wario Land Series of platfomr games, developed by Good-Feel and released for the Nintendo Wii in 2008. The gameplay consists most of shaking or flipping the Wii Remote to throw or manage objects. The game has only 6 worlds, but by searching into the game’s code, it was possible to find many stuff that weren’t used in the final version. Probably, Wario Land Shake It could have been be bigger, with more enemies and bosses. This enemy is similar to the Bandineros, found in most of the stages in the game. This enemy isn’t near for it’s completion. Many sprites are missing, there are some incorrect pixels on the border, and there is many proportions problems. 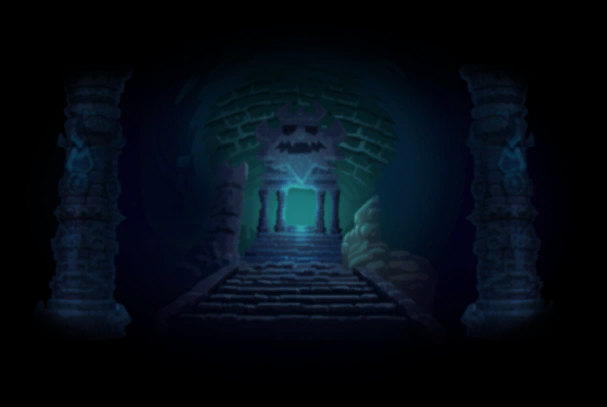 This enemy could appear in the sewer in the Mansion levels, or in the Cave levels. This is a very well done enemy. There are plenty of animations, functions, attacks. This enemy could be tough to beat if was used in the game. This enemy could appear in Desert levels, or the Train levels. This very well done enemy, could probably have an intelligent AI, probably would very similar to the Boo’s in the Mario Series, or the enemies in the Flying Ship from Super Mario Bros. 3. This is obvious that would appear in the Water levels. His animations are very strange, and it’s really unknown about it. So I ask myself, where are the pearls? Strange enough, this enemy would use models for it’s usage. There is also another recolor on the game files, but isn’t presented in video. As in the sprites, it could be a boss that comes from the background and tries to attack Wario, that is my theory. Donkey Kong Country Returns Beach boss probably got the idea from this unused boss. Simple, 3 enemies standing like a pillar, doing crazy stuff. As in Donkey Kong Country Returns, the same thing happens. This enemy has a LOT of animations, there is lots of details and configurations for it. But sadly, this was unused. Probably, this guy would be on the most craziest stages in the game. Probably, it would be really nuts jumps and platforms. Okay, heading back. This enemy would probably be a platform enemy, and if Wario stand too much above him, he probably could shrink. 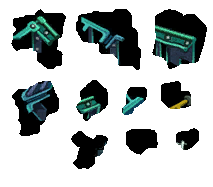 Talking about Unused stuff, there are some objects that was unused in game. A beta version of the Big Gold Bag. There is no marked “G” on his front, just like the small ones. Fun Fact: In the game box, the Wario is shaking a Big Gold Bag without the “G” mark. Unused Ball, is that would be like Chain Chomp Ball of Yoshi’s Island? ScumFlower/BloomsDay gold pot. Probably would be a easteregg for complete the game 100%, but they might didn’t implemented. – This is the only boss that don’t have his icon on the Mission icon. And in the Menu files, there are many unused stuff. 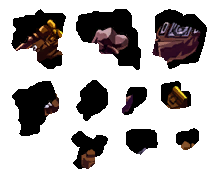 There are some menu sprites such as a “X”, is that would lost on a boss and never return? A opened Chest as a sprite? It surely was replaced to the Treasure icons. There is a beta thing in the game files. In the last boss battle, Wario would be in the Right Side, not in the Left Side (as in the Final version). The folder is probably used for the E3 conference, because it’s called “DemoWario”. Last updated by U64 Staff & Contributors at 21-01-2012 . The 3rd unused enemy sure reminds me of the fat boss from World 4 of Bomberman DS.